How can we give back to the community that supports us? Give back to the community that supports us. 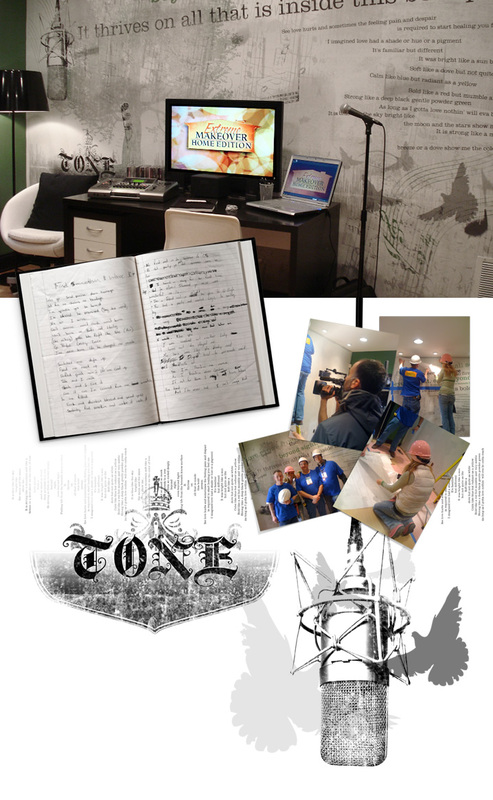 Developed and designed a mural reflecting the passion of a spiritual lyricist. When Extreme Makeover Home Edition came to town, we saw an opportunity to give back to the community that supports us. We donated jackets to the build team and through that, an opportunity to be a part of a room design emerged. We had the pleasure of creating a mural in the homeowner’s room to reflect his passion as a spiritual lyricist. Additionally, we made a custom leather bound book with a collection of his past work with room for future endeavors and even made it into the show. Connect with us today to find out how we can together give back to the community.